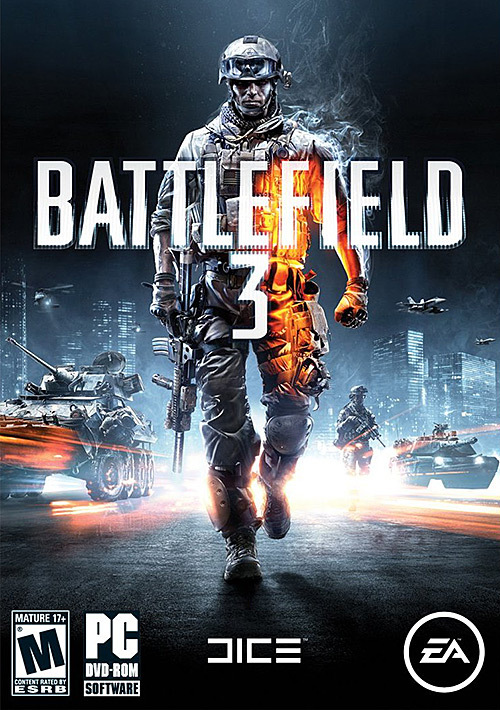 The much anticipated game Battlefield 3 is now available, however it has turned out to be a bit of a disappointment for all the stereoscopic 3D gamers as initially the game does not have support stereoscopic 3D mode. I’m reminding you that the game’s developers have promised support for both Nvidia’s 3D Vision as well as AMD’s HD3D technology with the game engine actually doing the stereo 3D rendering (native 3D support). The problem is probably caused by the developers not being able to have the stereoscopic 3D support fully working, so it is not yet enabled in the final game, it should hopefully soon come via a patch to update the game. Both AMD and Nvidia have been releasing beta drivers for a while to improve performance with Battlefield 3 as the game is quite demanding if you want to enjoy all the visual extras to the maximum. The latest Nvidia GeForce 285.62 drivers apparently already have a 3D Vision profile for the game giving it Excellent rating, but you are not going to be able to play it yet in stereo 3D mode. Currently when you run Battlefield 3 you are prevented from being able to activate 3D vision in it, a failsafe mechanism implemented by the game developers in order not to give false impression about what the gamers will get in stereo 3D mode when the official stereo 3D support becomes available. So for now you are stuck with playing the game in non-stereo 3D mode, but most of you can at least enjoy it with a 120 Hz refresh rate (if you have and use an active 3D solution such as 3D Vision). I got this game just for the 3D… Major disappointment! Be aware the shadows dont quite work right and you will need to adjust convergence and depth but this might be enough to get you on 3d Bf3 for now! I didn’t do anything special, however I’m using 3DTV Play (standard HDMI 1.4a display), and not 3D Vision. Updated to the latest GeForce driver package (285.62) including stereo3d bits, checked the enable stereo3d box. Checked to be sure the BF3 profile was listed and ran the game. No disabling of the NV S3D service hackery or anything. In game, I chose a 3DTV Play compatible resolution (happend to be 720p60), and the display switched to S3D mode as you’d expect and the menu screens were displayed in S3d. This is probably the same thing MikeArms24 mentioned (hope they fix it)… and yes, you do need to manually crank the depth and adjust convergence. I also found that alt-tabbing out to the desktop and back in again would reset the convergence to defaults and you need to quickly adjust. Hope the rest of you can get ‘er working too. I will have to wait on this purchase for my son. He is looking forward to Battlefield 3D but the article confuses me about whether or not it will work on our 3D tv. My husband takes care of these things along with my oldest son. Tnank you for writing about the difficulties, I would sure hate to disappoint my Nicolas. It seems that there is no detection for 3DTV Play, so you can use it directly with the game, however in this situation (as with the workaround using 3D Vision) the stereoscopic 3D rendering is done by 3D Vision and there are some visual artifacts present. Meanwhile I’d recommend not to ruin your experience with the not so excellent stereoscopic 3D output available with 3DTV Play or using the workaround for 3D Vision. Using 3DTV play I can enable S3D, here, with new drivers. But I think it´s unplayable because of the issues realated by Frobozz. To minimize the shadow/lights problems you have to decrease a lot the 3D deph, putting it in level 1, wich is nothing. I don´t want play de multiplayer in 3D and I don´t think I´l wanna replay the single campaing only because of S3D. Shame Dice/Nvidia. I want 3d option for consoles 2!!! Whatever happened to the day 1 patch for the PC? I tried the workaround and got the 3d to work…. There are a lot of problems, but you can certainly tell BF3 should be great with a proper patch. The shadows and lighting are all wrong. Not sure if looks better with 3dtv play for some reason, but with 3d vision it really is unplayable with the artifacts… I say a game with 3d problems like this makes my eyes feel like the are bleeding and gives me a headache in about 2 minutes, so I am not sure how any of the other users think it is playable. It also looks to be running 3d in the game engine, not through 3dvision. I noticed almost no drop in FPS and my system is partly dated at this point. Other than the shadows/lighting problems the 3d seems great and runs very smoothly. I would think it will be addressed with a future patch. For anyone playing around with this, hit f7 after adjusting convergence and separation to save your settings. I tried to launch using either DDD or iz3D…. no apparent way to launch with DDD, and having the iz3D driver enabled will crash the game. Really awesome sim, too bad it’s not in s-3d. Some objects don’t render in both eyes, most noticeably on the menus, there is also some sort of a problem with rendering of fences and radio masts etc., as you move they look very aliased and this makes it difficult to see enemies through fences or obstruction. The game has the potential to be great in 3d and this is a good start for them, but to be honest with you, they restricted the 3d aspect up until now to polish it to a bright shine… I’m afraid to say that bright shine is not present yet, I would have rather they released it straight off and assured us that they would improve it, the anticipation alone makes the end result a let-down. Is it good, yes, it looks great, but as far as gameplay is concerned, it is made much more difficult as a result. Great that we can now play in 3d though!